a new report by Juniper shows. creators could be taking the lead. out there. Last year, the increase was a mere 155 percent. apps and vulnerabilities across major mobile operating systems. malware is targeted specifically at Android. 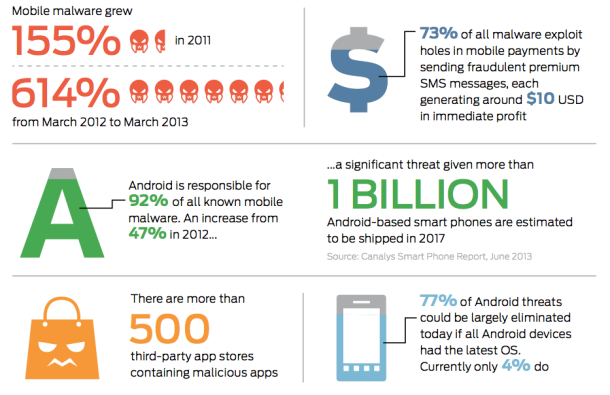 cybercriminals are Google Play, Skype, Adobe Flash, and Angry Birds. Recently, even a malicious “Bad Pigs” app was found masquerading as the popular Bad Piggies game on Google Play. and personal information stored on devices. Networks Mobile Threat Center director Troy Vennon said in a statement.